Let’s face it: Wild turkey legs, wings and to a lesser extent thighs can be unbearably tough, and the tendons are often as tough as bone. The answer? Turkey carnitas. Simmering your drumsticks for a long time in fat or broth, then shredding the meat and serving it in a taco or burrito, or in whatever make you happy. Most versions of carnitas are essentially confit — they cook the pork or whatever slowly in lard. This is fantastic, but it requires an awful lot of lard. 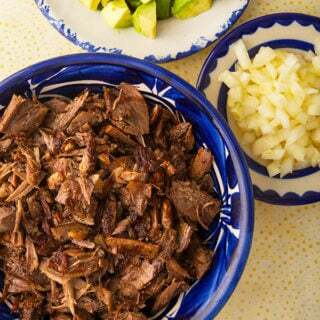 I prefer to follow the braising method that Diana Kennedy uses in her excellent cookbook The Cuisines of Mexico. You can of course use other meats here, too. I’ve use the legs from geese a lot, and it works great. Pork is traditional, pheasant is fine, and if you are blessed with a bear with good-tasting fat that would also work. And you can do it with venison, but I prefer a similar technique called barbacoa for here. If I can give you one piece of advice here, it is to take your time. Turkey will get rubbery and nasty before it submits and becomes smooth and luscious. If you need more water, add more water. This recipe will require at least 3 hours of your time, maybe more if you are cooking an old Tom. Be patient. It’s worth it. Why? Not only because the meat will blow you away with how good it tastes, but also because so many people toss out the legs of a wild turkey. I know dedicated, life-long turkey hunters who were raised to believe that wild turkey legs — thighs and drumsticks, not to mention wings — were inedible. This is simply not true. In fact, the thigh is my favorite part of a turkey, and, once you strip the meat off those awful tendons, the drumstick meat is almost as good. 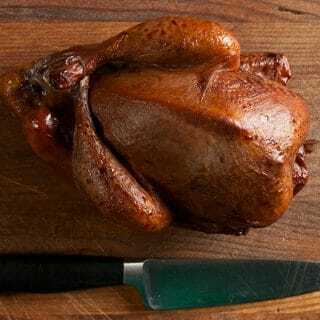 Give this recipe a go if you find yourself with a wild turkey. Please. You’ll be shocked how good it can be. A note on the recipe: I’ve updated it since I first published this recipe years ago. It used to have 10 crushed juniper berries, plus a tablespoon of cracked black peppercorns and a tablespoon of crushed coriander seeds. I not longer do that, but if you love the old recipe that’s what you’ll need to add. I of course use wild turkey here, but a domestic turkey will work just fine. You could also use pheasant, an old chicken, a guinea hen or just go full-on traditional and use pork shoulder. Once you braise the meat and pull it off the bone, it will keep in the fridge for a week. Crisp it up before you serve it. 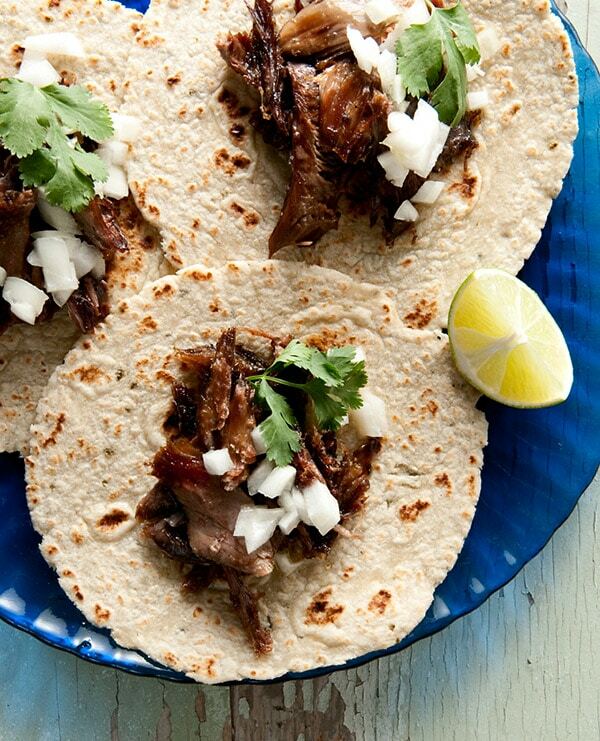 Once you make this, the finished carnitas will keep for a week in the fridge. I usually reheat it in a frying pan with a little oil. Set the turkey in a large pot, such as a Dutch oven, and add the turkey stock. Add enough water to cover the turkey, then all the remaining ingredients except for the lard. Bring to a simmer and add salt to taste. Cook gently until tender, anywhere from 90 minutes to 4 hours, depending on whether your turkey is store-bought, or, on the extreme end, an old wild tom. When it is tender, remove the turkey from the pot and let it cool. Shred the meat off the bones and, if using thighs, shred fairly fine -- remember this will be a filling for tacos or burritos. You can store the meat for up to a week at this point. To finish, add the lard to a frying pan and brown the meat as much as you like. I like a mix of soft and crispy, so I lay the meat out in one layer and crisp just one side. I prefer this in soft tacos, with the traditional accompaniments: limes, onions, maybe a hot sauce or two, roasted chiles and cilantro or parsley. A homemade salsa verde is a great sauce here. You can find lots of recipes for turkey and other upland game birds right here on Hunter Angler Gardener Cook! WOW!!! This is awesome! Huge hit at my house. Fabulous and awesome. A little chew–as expected–but not rubber. Flavors of chiles with a hint of the cinna chaser gets the thumbs up. Cleaning out the freezer and starting the new year with turkey legs in the pot…Carnitas for dinner! When I shot my first turkey in 2018, I was determined to use the WHOLE bird; not all at once, mind you. Breasts for this, tenderloins for that, wing dealies on the smoker and maybe the drumsticks on it, too. Heck, EVERYONE who’s been to Fronteirland at Disney has snacked on one of those giant turkey legs, how hard could it be? When I put the wings on my smoker and got them up to the right internal temp, I figured I’d eat them right away and savor the wild goodness. It was like biting into a steel-belted radial. I powered through, but I knew I couldn’t abuse my drumsticks in such a manner. The first thing I did was scan Hank’s turkey recipes and stop on Turkey Leg Carnitas. This recipe is now bookmarked on my phone. It is that damn good. I’m a sucker for juniper berries in wild game and this has those plus more fun for the mortar and pestle — peppercorns, coriander seed and cumin seed. The last batch I made in late March was highlighted by the fresh cinnamon sticks I had bought recently. If you’ve got old cinnamon sticks kicking around the pantry, you might want to replace them before making this. It really adds to the flavor profile. After two hours, three domestic turkey legs were perfectly tender, with all of those cable-like tendons easily removable. A wild bird is a bit more jacked in the legs, so, like Hank says in the instructions, you should tack on some cooking time. I can’t recommend this recipe any higher. If you’re one of those guys who only breasts out their bird, shame on you! You’re missing out on a great meal that’s relatively easy, but positively delicious. Give this a try with your next turkey. Awesome recipe! This year I threw all the ingredients into a pressure cooker (Instant Pot) for 1 hour. It was enough, but an extra 15 min. might not hurt. Much better result than on the stove top, where last year I managed to run out of liquid and burn some of the meat. This way, plenty of broth left. To serve, I fry onions in a skillet with olive oil, add servings of meat and fry that, too. Then I add a ladle (maybe a couple of Tbs) of the broth, cover, and let the liquid finish cooking. Put the result in a burrito with avocado, cheese, rice, and black beans. Microwave (or broil) to melt the cheese and serve with salsa and tortilla chips.